i LOVE, LOVE, LOVE this quilt SO much!!! you may consider yourself just a beginner, but you are fabulous darling. I love this quilt! This is the quilt that made me start reading your blog!!! I really like that quilt! I want to learn to quilt, but havent gotten around to it yet. Oh now this is just wonderful. I LOVE pinwheels, this is just so cheery bright and summery. Well one! Your quilt is crisp, colorful, and fun! You did a wonderful job on your first attempt at triangles. I am self-taught; each new quilt I made had one new thing in it I'd never done before. Keep up the beautiful work! Well you did a beautiful job! The colors are happy and fresh against the white. Pinwheels are such fun blocks. Great job, I know just how you feel about the nerves, Just go for it. You are fab! I love this too! I've been admiring it on your header! I've always had a thing for pinwheels since I saw Meg Ryan's quilt in You've Got Mail. I've been wanting to try one - did you use half-square triangles? Love this quilt! In fact, I have one almost the same being quilted as we speak. You are making me wish I had added a border to mine. Love it! This is one of my all-time favorite ever quilts! I'm so glad you got over being afraid, and you're entering it!! Go, V!! This quilt makes me want to lie down in some grass and drink lemonade. I LOVE it. Way to go for entering! I love this quilt! This one has been on my list for quite some time...I just need to go ahead and jump on it! Very very pretty... I love those early morning photos... Right, it was taken in the morning? This is a fabulous quilt...be proud!! 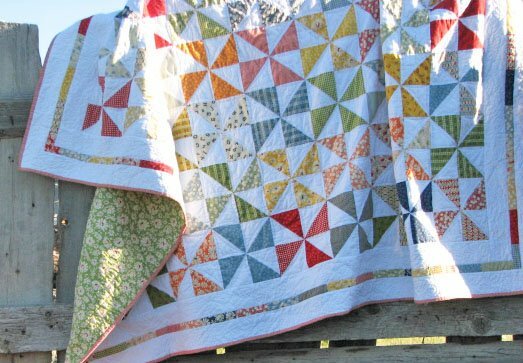 Very classic and timeless looking..
You certainly conquered the triangles with this quilt. Beautiful. I love, love, love pinwheels and yours is beautiful! That quilt is amazing! You did a wonderful job and I am so grateful that you showed it! I have been dying to make one similar--hopefully this summer I can tackle it! Have a happy weekend! What a wonderful quilt. I love all the colors in it. I have always loved this quilt. I even bought some fabric to make one of my own, but I don't like the fabric as well as what you used so I'm having a tough time wanting to actually use it! How fun that you got to meet camille, or maybe you already know her. Your blog and hers are the two blogs that I check daily. I'd love to meet you both sometime but I think I'd looks like one chubby woman standing next to the two of you! I love this quilt! I always look at it in you header. 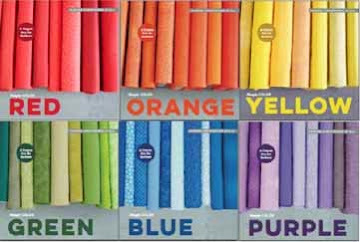 I think it's the colors, or just loving the wee play fabrics I see! Rather makes me nostalgic for stuff that was way before my time! I really love that quilt! Now I am a beginner...with lots of fears about quilting. I can't wait to see what you are going to show us to make...you mentioned something below. I have my first really big run this weekend and will be ready to sit and craft next week! It i sgorgeous, V! Hugs to you and have fun! Your quilt is gorgeous! In my book, you are definitely not a beginner. I think you are amazing!!!! It's a beautiful quilt. I love the colors. Pinwheels are one of my favorite quilts. Love it!!!!! I love your quilt. Pinwheels are just to happy. 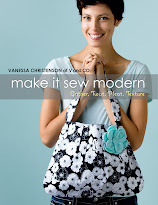 If you are just a beginner than I might as well put up the sewing machine. That is amazing. I truly am a beginner and only aspire to make a quilt that beautiful. I have been loving that quilt since you put it on your header. It' so bright and cheery. Love the colors. You have such a great nack for putting colors together. I'm so glad that you shared this and that I got to see it. You inspire me! Great quilt. It doesn't look like the work of a beginner. Super fabric choices. Well done! I love the border you did. You obviously have a great eye! When I first got my sewing machine last December, I used this pattern as well for my practice piece. I will be revisiting this again because it is such a lovely pattern to show off the colors (planning to use solid cotton sateen I think). Very cute. It makes me think of relaxed evenings in the summer when kids are chasing fireflies and adults are on the porch drinking lemonade. Love that quilt so much - I love all the white in it! I copied this quilt after seeing your pinwheel tut.....it is at the quilters as we speak...my husband liked it so much I am going to make another one that we are donating in memory of his parents (we lost both of them in 2008) we are donating it to The Hospice House, we thought the colors were cheery and who does not like a pinwheel? Have you ever thought about setting up a flickr page for people to post pictures of things you have posted on Moda or of tuts on your blog? This is so adorable...in fact..your whole blog is adorable. So glad to have found it! Beauty FULLLL!!! I love it!! What a talent you are!! Very nice quilt; I love the colors! I love your quilt and I loved your tutorial for it. I made a much smaller one and it was a big baby step for me in the quilting world. Thanks for your terrific instructions! Love that point matching. Seriously it is a beautiful quilt. Wonderful. So bright and cheerful.